Denzel Washington is one of the best actors of our time. I know this isn’t breaking news, but it doesn’t hurt to say it again. He has the ability to enter into any role, develop a deeper character than you ever saw coming, and then turn around to do it three times every year. But therein also lies the problem; he does so many movies that some are bound to be awful. John Q, Unstoppable, Deja Vu; he might not be bad in them but they had almost no chance of being good movies. And of course on the flip side you have some of the best films ever made: Training Day, Crimson Tide, Glory. My point is that you might watch a movie because Denzel is in it, he has that star power, but you never know exactly what you’re going to get. With Flight I was pretty sure I knew greatness was coming. 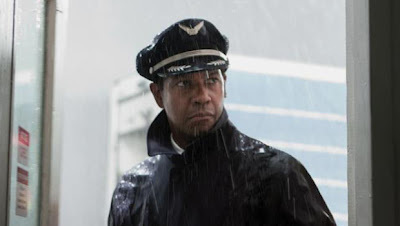 In this film, Denzel plays Whip Whitaker, an excellent pilot, but also a colossal drunk. He drinks, he smokes, he gets high, he gets low, whatever. And the night before, the morning of, and during his most recent flight he is pretty wasted. He’s been living with it long enough to not let his drugs affect his flying, but when disaster strikes his airplane and it crashes, his lifestyle comes under scrutiny. He may have been the only pilot who could have performed the miraculous maneuver that saved the lives of most of the souls on board that day, but being intoxicated is against the law, and when his toxicology report shows the chemicals in his system he faces life in prison. And while Whip might be able to beat the rap, he can’t seem to beat his addiction to alcohol, hero or not. It seems like a trend of the movies I’ve been watching, but once again a movie starts out amazing and finishes so so. With Washington and Zemeckis on board for Flight, I knew it would be high quality, and it was. The beginning was great, the music was awesome throughout, and Whip was an extremely interesting and deep character. The problem came when the movie became about addiction. I’ve just seen too many. I wasn’t looking for another AA session, another sob story, another “religion fills the hole in your life” film. And while at first I thought the film was poking some fun at these things, it ended up being about these things, and that’s not what I wanted. I wanted Denzel to be amazing, which he was. I wanted the side characters to be strong, which they were. But I wanted the end to be original, and it just wasn’t. I was left feeling a little disappointed, since it all started so well and finished a little limply. Flight turned out to be a good movie, but not as perfect as I had imagined it would be.